Knees are fairly easy to assess. A tear needs to be repaired. A knee that has strain that requires OMT are those that don't hurt all the time, they feel "wierd" or "funny" with specific motions. When I find knees with strain, even if the patient does not know it, I still can treat it and prove to the patient it needs to be treated. One patient says that the only way she can describe it is if you walk around with weights, after you take them off, that light feeling is what it feels like after a treatment. Scott is my very first adult patient, the one whose whiplash I treated while still in pediatrics residency. I was confused about my amazing results with him and it led me to look further into osteopathy. After cleaning up his neck, I did not hear from him for two years. One day he calls me up and says, "Remember my knee?" I responded, "Yeah, the one you wouldn't let me touch?" He called to ask me if I could help him with his knee, the one that had been operated on x 3. The first surgery was to repair a tear. The second and third were to scrape off "inflammation" after he continued to have pain despite physical therapy. When he came in he was a completely different person. He lost weight, looked slim and healthy. He felt so good after I treated him, he was able to return to soccer, his favorite sport. He had injured his knee and waited for the strain to settle down. It did not. He came in limping and the knee was swollen. I treated the knee, it was only somewhat better. I examined the ankle and stabilized the ankle mortise. Lo and behold, after treatment, the knee swelling resolved. He was able to walk out of my office without limping. David is 40yrs old and he is very active in basketball. After several strains from jumping and "landing wrong," in one final injury, he tore a meniscus. He had surgery to repair it. One year later, he landed and heard a pop. He saw me once prior to his scheduled appt with his surgeon and got only 10% relief. After evaluation, the surgeon did not agree to get an MRI, and certainly declined to surgically explore. He continues to walk with pain. He comes back for a second treatment. As he lays down for his exam, he says, "I read your brochure while I was in the waiting room and I forgot to tell you that I was in a car accident 2yrs ago." I decided to treat his chest first. Once I determined that the chest strain was resolved, I asked him to get up and test the knee. His knee pain was better. How much of it was resolved? He stated 50%. I then proceeded to treat him below the knee. Once the strain was resolved, how much was the knee improved? 10%. I proceeded to treat his thigh; the thigh strain contributed 20% to the knee pain. I finally get to the knee and treated it. He gets up and tests the leg. The knee still feels strained by 10%. This case is a great lesson in the layered physical strains that contribute to problems. Francisco is a 32yo. He comes for After Hours care for a bronchitis. He has been coughing for 2wks. As we review his other symptoms, I learn that he has had shortness of breath (SOB) x 2yrs and knee pain for several years. He was seen by his PCP when the SOB first started. Meds did not help so he was sent to a pulmonologist. He had pulmonary function tests done and they were all negative. He was sent home with a prescription for Advaire, which he stopped taking because it did not help. I told him that he had an acute chest infection on top of a chronic chest strain. He sat quietly thinking this through. I told him that he needed medications to treat the bronchitis first and then with OMT we could resolve his SOB. There was no way for me to prove this. But if he let me, I would treat a knee. I proceeded to treat one knee. He got up and tested it. It was completely better. I asked him, has anyone ever been able to help him with his knees? No. I told him that in my book, whoever gets results, gets to tell him what the problem is. After his bronchitis clears, he returns for OMT. Despite a sedentary job, with exercise, his SOB is resolved by 80% . This is Carla. She came to me for knee pain. Two years ago she fell on the left knee x2. As time went on, the knee started to angle out. We call this a valgus deformity. More info - she had a previous surgery to that big toe on the left side and the skin is partially numb. When she comes in she fails to tell me that she has a scoliosis, an old diagnosis. The before picture is hers in her home. The after picture is in my office after her second visit. She has more feeling in the big toe, it feels better. The knee feels better and her scoliosis is much better although she is feeling pain in her back as it is correcting. This is Rita. She came to me because Tony referred her. Rita had painful knees. The surgeon did the L knee first with plans for operating on the R knee following her recovery. She did not recover well. The sutures popped open before she completely healed and she was still in pain afterwards. 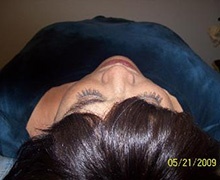 Rita has had multiple dental procedures, R eye migraines, hair loss and panic attacks. In the first photo (left), her R face is completely caved in. I was afraid to do too much and stopped here (2nd photo, right). Within a few minutes, she had a panic attack and we had to stop. She went to the restroom and took a break, assisted by her daughter. In discussion, we agreed to going all the way and proceed to max out the treatment and let me do 'more.' She was paying cash and wanted 'bang for her buck.' Upon leaving, her daughter thought Rita's face was changing. That evening with her husband, she felt as if her R eyeball was "popping out." [ Her right face is widening and filling out and her eye is balancing out; it has been compressed for so long that filling out to normal feels abnormal]. After this first visit, her knees no longer bother her. Rita returns for 2 more visits because she was sleeping better, had more energy weight around her middle without doing much more than her usual walking. Total visits: 3, total cost $700.